Click to see it larger. The map is from the Library of Congress collection. If you really want to pore over it, they have a giant version (a 230M TIFF file) you can download. I love this picture and the detail it shows. I worked near the corner of Congress and A in the 1970s and 80s in one of the brick buildings shown. Much of area around Melcher, Summer, Congress, and A hadn't changed a whole lot by the 1970s. Many of the buildings in that area were originally dry goods (cotton and wool) warehouses. Even in the 1970s the dust from the dry goods business permeated the buildings. Love this post, thanks Adam. I think there is a plaque recognizing the historic Wool District - I think it's at the corner of Summer and Melcher. Seems like a better use of the area than those modular glass buildings. You would take good paying jobs over freight car storage and wool warehouses? Where did you take economics, Hee Haw University? There is a reason why the biggest rail yards in New England are in Worcester, South Portland, and Billerica. They don't provide enough jobs and the jobs that are provided aren't exactly wonderful. Besides have you ever been in a rail yard? Are you immune to constant diesel fumes and oil spills effecting your health? Sometimes the luddite comments on these boards make me question why the user even has a computer. It seems it would be against their views owing to the need to go back to "better days". I hope your horse doesn't freeze up as you drive old Bessie and the wagon to Church Meeting over yonder hill tomorrow. I wasn't being serious, jeez. Over-react much? The rail yards were there because the port facilities were there. 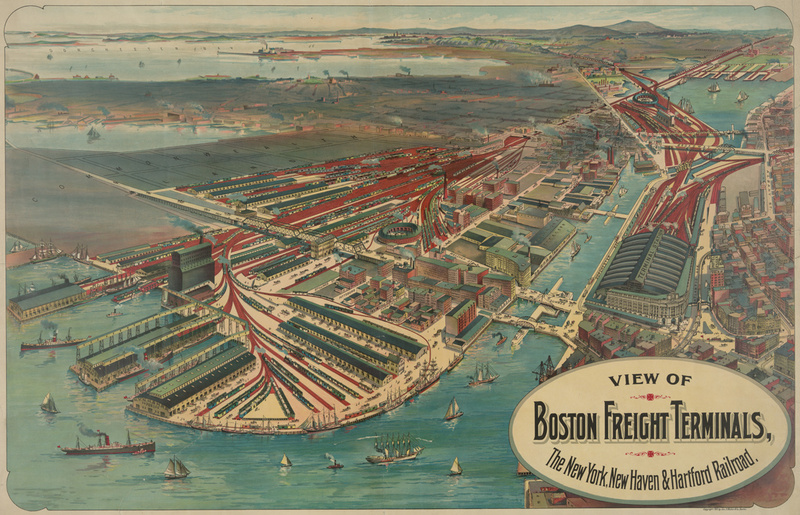 Boston is no longer a major port, and the port facilities have been moved. When these rail yards were active they transported goods to and from the ships on the water, with goods moved piece by piece from train to ship and from ship to train. Now everything is in containers and the container port is elsewhere (as is the car shipping port). What would all these rail facilities do? Exactly? One of the reasons the BPDA gave recently for trying to reduce the percentage of land in the marine industrial park devoted specifically to marine industrial uses was the lack of rail access to the docks there (and never mind the Conley container terminal near Castle Island). All that's left is that one single track that the T now wants to use for testing out new Red Line cars. So there is enough of a port left that could use a rail link, but, well, it's too late now. And, of course, the BPDA would never admit blame for letting that happen even if it is in charge of land planning in the city. That ship has sailed, so to speak. The port of Boston fell out of favor because shippers can't double-stack containers on rail-road cars, due to bridges being too low. The tracks are gone because they weren't being used. It's not like people who do these things for a living will start using Boston again, like hipsters who suddenly start babbling that cassettes have superior sound. Some years back [as reported on UHub] the city tried doing some work to boost the Connelly container port capacity and use. But without the ability to load trains directly there, and no easy way to path a track there that would readily connect to lines west to CSX new yard in Worchester, or to the present at the time Beacon Yard, much of the freight plan did not come into fruition. ...and the easiest freight to move because package sorting is relatively easy (they can sort themselves, usually), then some type of expanded port/passenger ship utility makes sense. If the passengers from cruise ships can get to Boston historical landmarks easily, then it could be profitable to build better infrastructure. Maybe the best investment is the easiest. Better port facilities for passenger ships and, well, buses for the freight---I mean nice tourists that pee a lot. Containers of IKEA furniture or Goodyear tires? Too bad, but I think our day as a major freight terminal got all blocked in. Whoever painted that model rail car needs to learn how to spell Worcester. That ship hadn't sailed. All the major roadways have been brought up to interstate standards in Boston or where have you been during the big dig? Its the NIMBYs who don't want the noise for themsevles whole want others to teake it and the state for not thinking ahead. This is not the 1970s. Shipping containers to HUB ports is no longer the rage. Intermodel shipping is and Boston had its chance for that and declined. Blame your government. Working freight rail to the Conley Terminal is a good idea. Working freight rail to Fan Pier, even if there wasn't the issue of all the buildings and infrastructure in the way now, wouldn't have any use. The ships that docked at Fan Pier back in the time of that postcard were much smaller than anything in use today. You just can't get a vessel of any size any closer than the Conley, the Cruise terminal, the drydock, and wherever along there they moor the aircraft carrier for Fleet Week. Also interesting what buildings still exist today over there, and why there were parking lots, in the not so distant past. It used to cross tons of train tracks. That "bridge" that went from Summer Street to Commonwealth Pier (now the World Trade Center) was a city street whose official name was "Viaduct". Not Viaduct Street, just Viaduct. The photo that johnmcboston posted also shows "Ramp Street" which connected Viaduct with the streets on the lower level, near the Fish Pier. Back around the 1970s and '80s there were two levels of streets there. Summer Street was the upper level, as was D Street. Congress Street and Northern Avenue, A Street and a short section of B Street were on the lower level. There were only two places where the two levels connected, Melcher Street and Ramp Street. Through the late 1960s and well into the mid-1970s there were many fire sin that area. The Summer St Bridge itself which once traversed the railroad tracks and yard burned at one time, and several of the old warehouse buildings went the same way to multiple alarm fires. There should be historical data on that someplace. Which is now just a driveway next to the Gillette plant. It was built long before the others and was the only connection over FPC. Southie had the Mt Washington Co-Op Bank for years but that was swallowed up by a bigger fish. Well, maybe this will work. ...when I used to park there back in the day. There were some old green passenger rail cars still there at the far end of the lot. Muddy as hell when it rained, and that trek over the Northern Ave bridge in winter is not a fond memory. Or was it fifty cents? It was $8 to park in the Seaport when I started paying attention to this around 2000. The cheap parking is gone, yet rush hour traffic isn't any better. The commuter rail still runs just as rarely, yet fares have more than doubled. Shouldn't the goal be to improve our standard of living? Interesting. The postcard has the same Summer St bridge, a different Congress St bridge, no Northern Avenue swing bridge - and another bridge halfway down the channel. The time period of johnmcboston's photo has the Northern Avenue Bridge. The other bridge "halfway down the channel" was the Mount Washington Avenue Bridge. It was originally built in 1854 to connect Kneeland Street with the area of South Boston that was newly being filled. When construction for South Station began in 1896, the street connecting the bridge with Kneeland Street had to be severed for the new railroad facilities. With no direct street connection on the Boston side, the bridge became superfluous. It was closed to traffic in 1904 and removed in 1909. Northern Avenue was authorized in 1903 and the bridge presumably built soon after that. Source: The 1910 edition of "A Record of Streets, Alleys, Places, Etc., in the City of Boston", available on Google Books. That South Station train shed must have been something to see. From my research it was among the largest in the world when completed in 1899. The Post Office wheedled nearly half the station’s rail yard doomed the shed -which was a maintenance headache anyway. Photos of the shed’s vast and spatially dramatic interior survive and became the inspiration for Architect Raphael Vignoli’s design for the Boston Convention and Exhibition Center. It was posted here. I will credit BPL, I guess, but it was posted here a while back by Adam. So, I guess AG gets the credit for posting it. I took the picture when I was a kid and the guy that developed the negative claimed it for himself. Where are those sailboats going? Far upper right, sailboats in the South Bay. Was there an outlet to the ocean there? Otherwise they'd have a tough time getting under those channel bridges ..
All the bridges on the channel were drawbridges so the sailing ships could get past them. There were several lumber yards and coal businesses along Albany Street in the South End that got their deliveries by ship. Even as late as the 1920s, deliveries by sail-powered vessels were still the norm for low-valued cargoes like lumber and coal. I recall coming across a Globe article once about the last sailing vessel delivery of lumber to the South End, but I don't even remember which decade the article was published in.